It’s no surprise that we love The Resistance here at TOG. So a new version with some special powers sounds great. Is The Resistance: Avalon as good as it sounds? Well let’s find out. We’re not going to explain the mechanisms of the game. You can read our review of The Resistance here, where we explain the game in detail. The new game is identical in basic gameplay; the difference is that there are roles in this game. The whole thing has an Arthurian legend theme, so the roles are characters from the mythology. The game seems to assume you’ll play with at least the Merlin and Assassin cards. Merlin gets to know exactly who the Minions of Mordred are. When everyone’s eyes are closed, the evil players raise their thumbs, and Merlin opens his or her eyes. So they have perfect knowledge in the game…but, they can’t be too obvious about letting their teammates know who the baddies are, because at the end of the game, if the Servants of Arthur have won, the Assassin gets one last chance. He can talk things over with the other baddies, and then he assassinates the person he thinks is Merlin. If he’s right, the bad guys win. Ever since I heard about that, I was troubled. It seemed awful that the baddies could win based on a complete blind guess. After playing, I’m less concerned. Usually the Assassin seems to be basing the decision on the way people acted, but there have been a few times when it’s a blind guess that happens to be correct. It’s really frustrating. Yes, the Loyal Knights who aren’t Merlin need to be doing more to make themselves seem like Merlin, but that doesn’t take the sting away. There are some other roles, too. Percival is a Servant of Arthur, and he gets to know who Merlin is. Mordred is a Minion of Mordred (duh). He doesn’t reveal himself to Merlin at the beginning of the game. Oberon is a Minion of Mordred, but he doesn’t show himself to the other Minions—nor does he get to know who the other Minions are. 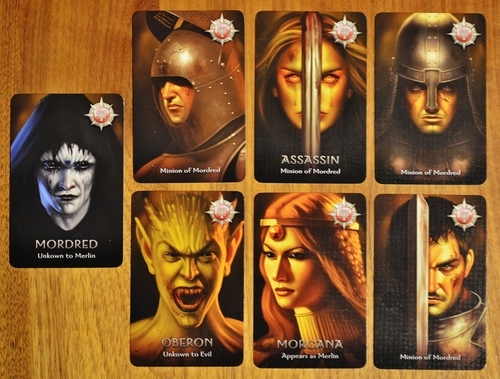 Morgana is a Minion of Mordred, and she gets to show herself as Merlin when Percival is in the game. So both Merlin and Morgana will have their thumbs extended, but Percival won’t know which of them is Merlin and which is Morgana. The Kickstarter copy also came with Lancelot, who might change allegiances halfway through the game. Firestone—The first thing I have to comment on are the components. First, a couple of the cards have a misprint on them: the word unknown is spelled unkown. This is a small mistake that doesn’t affect the game at all. It’s just shocking that it wasn’t caught. The other problem is this: Instead of voting cards, as you have in the original Resistance, you have tiles you vote with. After just one game, these were showing considerable wear—and after many games they’re in awful shape. I’m not sure why they went with tiles over cards, but it seems like a terrible idea in retrospect. Jeremiah—I couldn’t agree less! The first thing that I loved about the new version of the game was the tactile feel of the new voting tiles; it seems to streamline the hands-on feel and it’s easier (along with the Leader tile) to keep track of each different component and stage of a round. With the first version, cards always seem to get shuffled into the wrong pile or mixed up, etc. The durability of the tiles is questionable, but even my sleeved cards from the first set are showing signs of wear (and they don’t fit in the box as well). I also really enjoyed the new set of tableaus that are included. There is now a separate tableau for your game dependent on the amount of players, and each quest is labeled with how many knights are to go on that particular quest. It again streamlines the gameplay and requires less squinting from across the table to see how many folks you are selecting for the next quest. Firestone—Madness! 🙂 But I do agree about the tableaus. Those are super helpful and convey just the sort of info they need to. The roles are interesting. I like the uncertainty Morgana creates. Percival seems hard to play well; there are times when he really should reveal himself—or help in some way—and new people still seem hesitant for some reason. Oberon creates some fun situations: In one game I was Merlin, so knew the baddies, but didn’t know who was who. At one point a baddie put two Minions on a mission and I realized he had no idea he’d done that because one was Oberon. Of course, I voted that mission to go because I was more than happy to see them both on it; even if it failed they would almost certainly both vote to fail it, and now the group had a lot of information. The problem was that everyone noted that I’d voted for the failed mission to go forward, so now I was suspect! At any rate, I liked the mayhem that character caused. 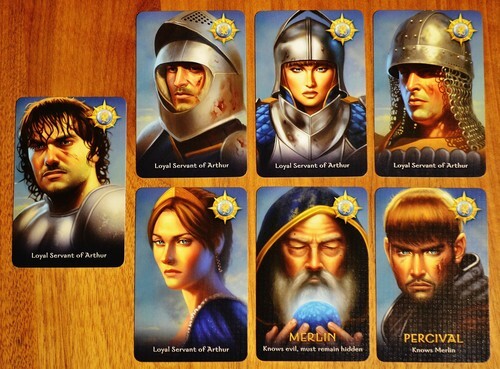 The Lancelot promo comes with a few variants, and we’ve only played one so far, but I didn’t like it. Two people are dealt Lancelot cards—one of which is a Minion and one of which is Loyal. You play as your card, just like normal, but starting on the third mission you draw cards from a deck and there’s a chance the loyalties will switch. Sounds cool, but if you’re on the last mission, and your side is about to win, and you suddenly have to switch to the losing side because of a card flip? Blech. What should have been interesting was just frustrating for whomever was winning (and now suddenly wasn’t), and a cheap victory for the person who was losing, and suddenly wins. Jeremiah—We haven’t delved too deeply into the different roles; it is stressed very clearly in the rules that you shouldn’t start adding more roles to the game if there are too many new/inexperienced players in the game, and as of yet, every time I have played there have been several folks new to the game. And grasping the roles, along with Merlin and the Assassin and how to play off of those roles, is quite the task, without muddying the waters too much. Firestone—Overall, this is a mixed bag for me. I like this version better than regular Resistance. But I don’t think I like this better than regular Resistance with the plot cards. You can play Avalon with the plot cards from the original game (we haven’t done that yet), but it makes no thematic or aesthetic sense to mix the two. I’m not sure why they didn’t create plot cards for Avalon that fit that theme. They could be the same exact ones, just with new names and art. I’m glad I have both, and we’ve certainly been playing Avalon exclusively since we got it, but I wouldn’t be surprised to see us return to the original over time. Jeremiah—With this I agree; I thought I would be more excited about this game than I actually am. I enjoy the level of strategy that Merlin brings to being a good guy; in the original it becomes a chore to hide your disappointment when you’ve been dealt an operative role. Trying to figure out who Merlin is, and then act as if you are Merlin definitely makes it fun for everyone at the table. The absence of the plot cards is palpable, even more so is the stark contrast in the theme when you try to add them in. The way the plot cards are played is a HUGE part of my strategy when playing a baddie, so I would LOVE to see them re-themed and offered as an add-on sometime soon. 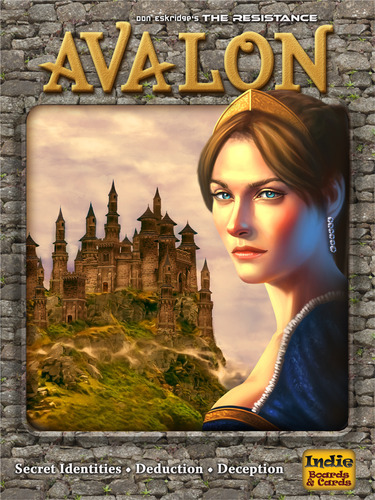 At its core Avalon is The Resistance, with more options and different aesthetics; I have yet to introduce the game to someone who didn’t want to play again as soon as the first one was over. And Avalon is no different. Firestone Update—Well, we’ve played this a bunch more, and have had no desire to return to the original yet. Still lots to be explored with just the roles, and we’re having a great time. I recommend this completely. You can find Resistance Avalon on Amazon here.